Zoe titled her entry ‘Made in Australia’, creating a rustic design to celebrate the birthday of a vibrant lady who likes natural and earthy materials and whose life has been spent wildflower farming in regional WA, surrounded by the natural beauty of our unique Australian bush. The recipient and her family have grown and sold many Australian and South African species for domestic and export flower markets. Zoe created a well balanced parallel arrangement that looks as though the materials are growing naturally from the wooden rectangular container, chosen for its rustic farmyard look but also out of practicality because it would support the heavy wildflower components. Hessian, rustic grapevine wire, chicken wire and wooden stakes were added to accentuate the rustic look. Her entry promotes the diversity of Australian grown wildflowers, with many of the 15 different products chosen specifically as they are the recipient’s favourites. All of Zoe’s plant material was well conditioned. Zoe focussed on the wonderful textures offered by wildflower products, using an analogous colour scheme of yellow, orange, red and pink to provide bright and exciting colours and forms that advance towards the viewer. Her design notes were very detailed and beautifully presented, including a list of floristry materials, a list of fresh material used, and a step-by-step description of how to make the design. Zoe discussed the techniques she used as well as the elements of design, also reflecting on how she might modify it. She also completed a client order form and provided a cost estimate including labour. Recipient: Irene’s friend Kate, celebrating her 43rd birthday and that she is a breast cancer survivor. 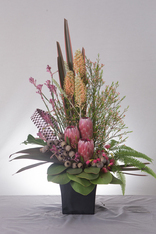 Irene’s entry features monochromatic red-violet hues (provided by proteas, kangaroo paws, gum flowers, waxflower, grevillea and flax leaves) and it has great line and movement. Based in a black flared ceramic container, Irene has used radiating form and line, with a single perceived point of growth. Her work is well balanced with good placement of groups and nicely presented embellishments – including the woven ribbon made using flax leaf and pink satin ribbon, looped to resemble the trademark breast cancer pink ribbon, also a symbol of hope. 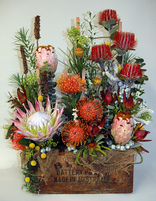 Irene chose the featured Protea ‘Pink Ice’ for its symbolic meaning of diversity and courage. Irene provided a great discussion of her use of texture and how she ensured correct proportions in the arrangement with her placements of materials. Ulrike’s entry is a colourful arrangement in a dark brown basket which has been well integrated into the overall design by placing dollar gum and other foliage to overhang the basket. Her colour combinations and their distribution are outstanding, featuring warm reds, pinks, oranges and yellows to create harmony, and green and white ‘spots’ provided by foliage and white waxflower respectively to add depth and contrast. The design is strong due to her beautiful choice of materials and their repetition throughout the basket. The arrangement can be viewed from all sides and Ulrike’s notes describe her efforts to achieve correct proportion and balance. Ulrike also gave thought to how her arrangement could be adapted by retailers - to feature different product through the year and to be made in different sizes.